I feel like there are little moments in the day to day raising of a child that mothers and fathers often look back to remember as some of their favorite parts of parenting. Maybe it’s the way babies smell after a bath, fresh and clean wrapped in a towel with their wrinkled toes still dripping the washed off remnants of the day or the way they hold their fork when learning to use their utensils, a fist of confusion mixed with flying food or maybe it’s the way they climb into your lap unprompted to cuddle in for a viewing of their favorite cartoon of the week. For me, one of my favorite moments is picking her up from preschool. Those minutes we share in the car completely uninterrupted by the chaos of household chores or mental reminders of conversations to have with other adults that come to fruition in their presence. Those minutes we spend just the two of us when she’s still running on the adrenaline that comes with being surrounded by fellow toddlers. She shares details of songs she sang and instruments she played and the favorite colors of her peers and we discuss what she wants for lunch and we disagree over the music coming from the speakers and I select a song I know she doesn’t particularly care for just so I can see that look she gives me and we laugh and we talk. Although we have other moments where it’s just the two of us and she shares these same types of moments with her mother, Allison and I both agree one on one time is important so she has her own way of communicating with us individually, there is something about that short car ride two days a week when I pluck her from the hustle and bustle of other parents and their children and we cocoon ourselves within our vehicle and mute our surroundings for a little while. I have a feeling I’m going to miss it one day and so I’m holding onto that steering wheel with white knuckles while I can… I’ll take her any where she wants to go as long as she allows me to come along for the ride. 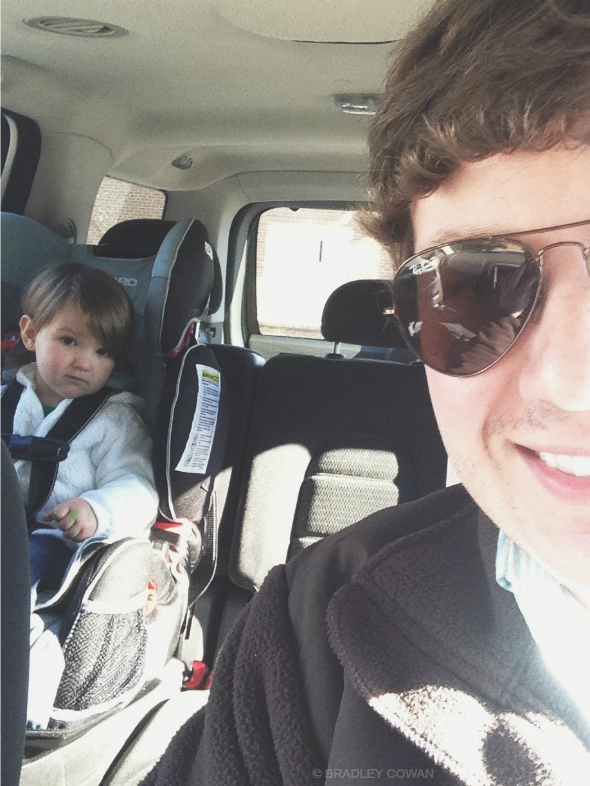 You know, now that my son stays at home with an au pair, I have to say I miss those car ride to/from daycare too! (Though the "to" ride isn't always great since he says he doesn't want to go). I love her little chubby cheeks and hands! Oh, how fast they grow out of them! Allison and I split the drop off/pick up duties... she drops her off in the mornings while I pick her up on my lunch break and she, too, says that I have it easier with the whole picking up end of the deal. And those cheeks! I love them so much.